Music Midtown made its annual return to Piedmont Park this weekend, bringing out some of the largest names in music entertainment. With over 75,000 fans in attendance each day, Music Midtown continues to show us its dominance as arguably the largest music festival in Atlanta. Since this was my first year of attendance, I wasn’t quite sure if I should believe the hype; although, after two days of amazing performances, thirteen-dollar beers and standing-room only stages, I must admit that Music Midtown was everything, and more. The set-up for Music Midtown was extremely sprawled, encompassing the entirety of Piedmont Park. After entering from 10th Street, attendees had the option to view any of three stages: The AT&T Live Stage, the Honda Stage, and the enormous Electronic Ballroom Stage–designated specifically for the headlining acts. There was also no shortage of adult beverages, with dozens of drink stations and mobile beer vendors. Although all of the stages were incredible, my personal favorite from day one was the Honda Stage, featuring some talented young women. Day one of Music Midtown was considerably less crowded than the second, but still featured some great acts. After doors opened at 4:00 pm, Ron Pope kicked off the performances at the AT&T Live Stage. Banks was one of the premiere singers of the day, performing the songs from her debut album, ‘Goddess’. Although Banks, Run DMC and Iggy Azalea all held their own with strong performances, none quite compared to the stage presence of 17 year old songstress, Lorde. I’ll admit that I wasn’t a fan of Lorde prior to Music Midtown, largely because I had failed to explore her music. That being said, her commanding stage presence, intriguing New Zealand accent and soul-snatching lyrics made me a believer. Swaying and writhing to the beat of smash hits ‘Royals’, ‘No Better’ and ‘Tennis Court’, Lorde’s infectious energy turned even the most stoic of attendees into a dancing machine. 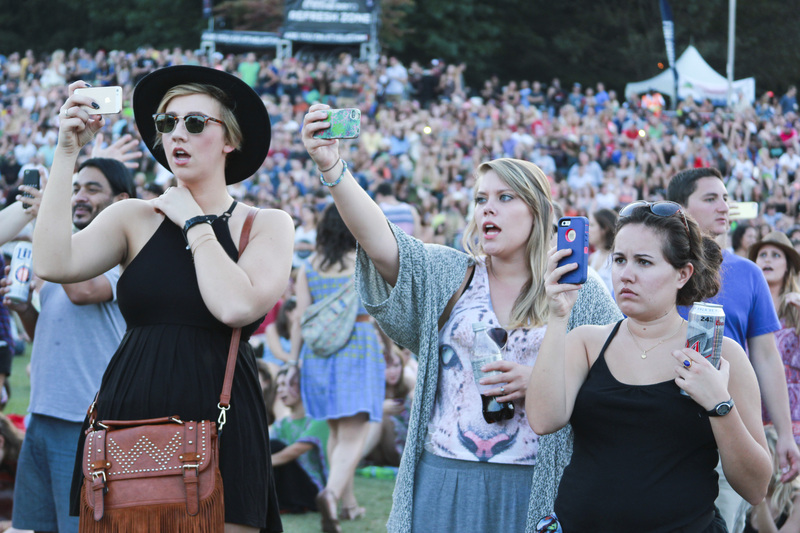 Day two of Music Midtown was packed to capacity from start to finish. Beginning at 12:00, the second day featured considerably more acts, including Magic Man, Vic Mensa, Third Eye Blind, B.o.B, Lana Del Rey and Fitz and the Tantrums. Despite this impressive lineup, everyone in attendance was there to see one person—Eminem, the real Slim Shady. 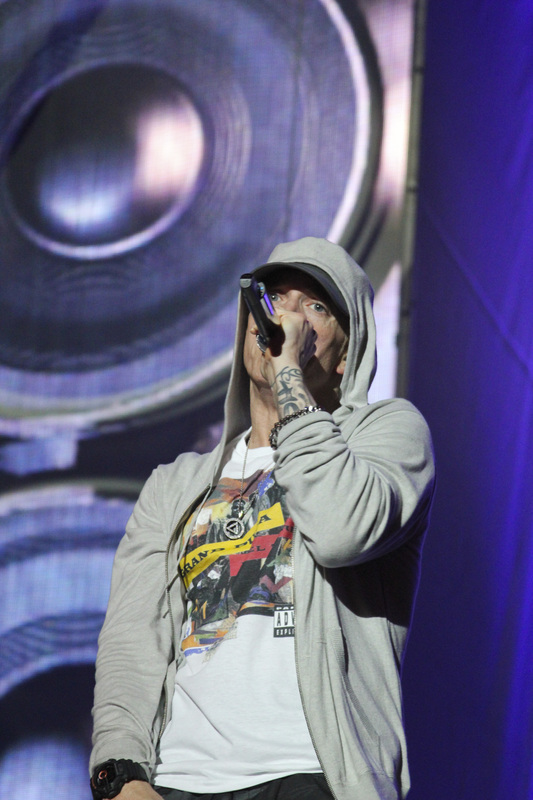 Eminem headlined the Electronic Ballroom Stage, which was packed to capacity over an hour before his two-hour set even began. Eminem’s live performances are something to marvel at, the most amazing part being his mastery of crowd control; Eminem had all 75,000 guests in attendance reciting his song lyrics word for word, from teenage kids to middle-aged mothers. Eminem performed literally every major hit of his career, including ‘Sing for the Moment’, ‘The Way I Am’, ‘My Name Is’, ‘Stan’, and the infamous ‘Lose Yourself’. Overall, Music Midtown was an amazing experience, featuring a wide variety of musical styles and artists. With one of its largest attendance totals to date, Music Midtown has shown just how much of a staple it is to Atlanta’s culture. It’s hard to imagine another festival topping this year’s lineup anytime soon.